My post of January 12, 2013, mentioned my maternal great-grandfather, John Carpenter Ford, from Wake County, Raleigh, North Carolina. John’s U.S. Army Enlistment Records of August 14, 1888, show his date of birth as January 15, 1864, which would have been just one year before “The ‘Great’ American Indian Wars began (1865-1890). His enlistment record also shows that this 24-year-old stood only 5’8” tall, had fair skin and grey-blue eyes. He was assigned to Infantry Company D, 17th Regiment out of Washington, DC. After serving 3-1/3 years in the Infantry, Private John C. Ford, just shy of his 28th birthday, was discharged on December 10, 1891, from Fort D.A. 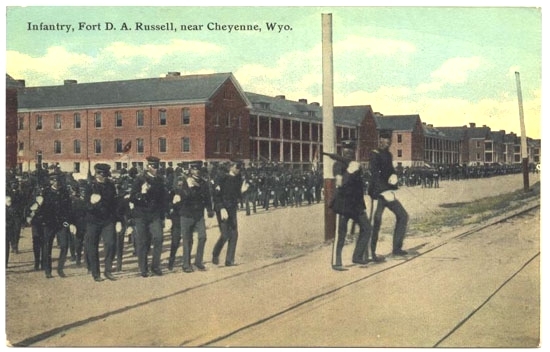 Russell, in Laramie, Cheyenne, Wyoming. 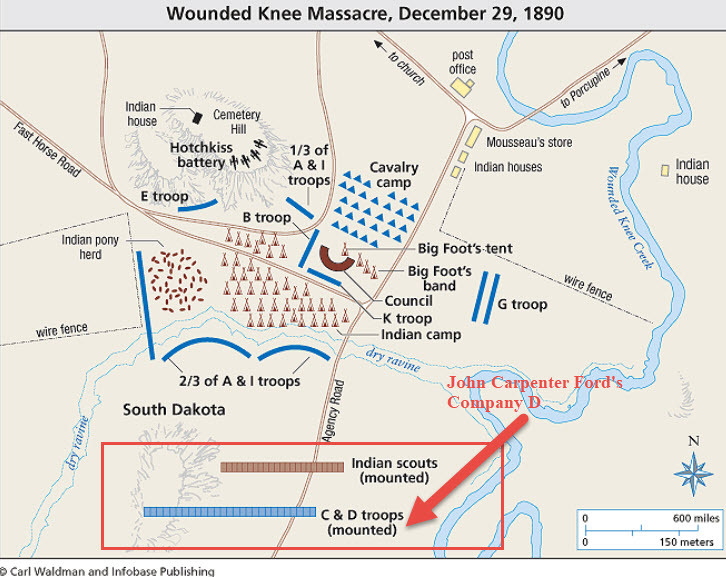 His record also included “General Order 80,” which was the U.S. War Department’s credit for battle participation and “Adjutant General Order 90.” The date of John’s discharge would also have been one year after the Wounded Knee, South Dakota, Indian Massacre. This regrettable and tragic clash of arms, occurred December 29, 1890. It was the last significant engagement between Indians and soldiers on the North American Continent, ending nearly four centuries of warfare between westward-bound Americans and the indigenous peoples. On December 29th, the U.S. Army surrounded a band of Ghost Dancers under Big Foot, a Lakota Sioux chief, near Wounded Knee Creek and demanded they surrender their weapons. As that was happening, a fight broke out between an Indian and a U.S. soldier and a shot was fired, although it’s unclear from which side. A brutal massacre followed, in which 230 Indian women and children and 120 men at the camp were killed. Army casualties were 25 dead and 39 wounded. The total casualties were probably the highest in Plains Indian warfare except for the Battle of the Little Bighorn. The battle aroused the Brules and Oglala on the Pine Ridge and Rosebud Reservations, but by January 16, 1891, troops had rounded up the last of the hostiles, who recognized the futility of further opposition. Although he didn’t speak of his infantry service that I am aware, this engagement could have left deep emotional scars on John and have been the cause for his later irascible disposition. When he passed away at age 97 on November 12, 1961, he was only one of two remaining Indian War veterans. 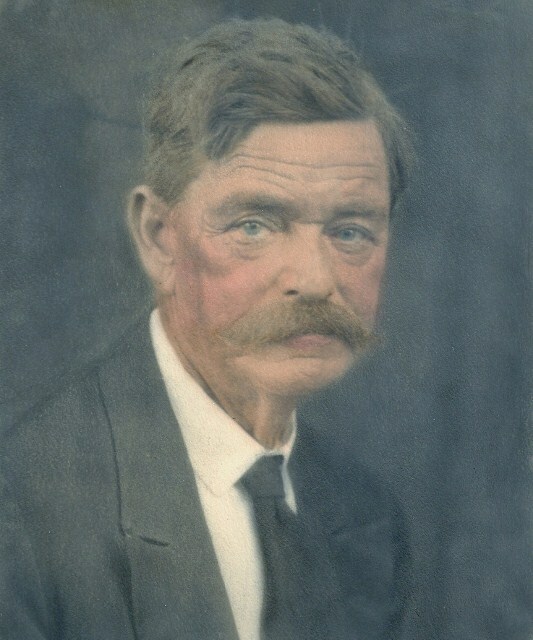 With his father, Robert Jackson Ford present as one of three witnesses to his Wedding Ceremony, John married Mary Susan Morris, age 20, also of Wake County, Raleigh, on September 23, 1894. The irony of their relationship–she was full blooded Native American and just three years later he had put the Indian wars behind him, and John and Mary Susan found each other and were married. Although, it appears that John may have lied to Mary Susan about his age as 27. He listed his year of birth as 1867 on the marriage register of Wake County, North Carolina. And the Decennial Census records beginning with the 1870 Census listed his year of birth as 1867. I believe he used his brother William Sherman Ford’s year of birth instead of his own to keep the 10-year age span from his wife. I discovered further evidence of John’s birth year as 1864 when I looked at his brother William’s death records at findagrave.com. There, William’s year of birth was listed as 1867. And, our family always went with John’s military records–which means John was in fact 10 years older than his wife, Mary Susan. As an American whose Native American heritage comes from my maternal great-grandmother Mary Susan Ford and my paternal 11th great grandmother, Pocahontas, my heart aches for all of those involved in these horrific injustices. And it aches, too, for my maternal great-grandfather, John Carpenter Ford, who because of his enlistment in the Army became a part of this unforgivable moment in history that haunted him apparently for the rest of his long life. You see, he and my great-grandmother separated in the early 1940’s because he was too difficult a man to live with. He moved to the National Soldier’s Home in Washington, D.C. where he remained until his death in 1961. Mary Susan lived with maternal grandparents until she passed away suddenly in her sleep. She was 73 years and 7 months old–and I was just 14 months. I sometimes worry that I may add too many of my values and feelings within my posts, that may turn off some people because they don’t share the same sentiments. But, I always want to be true to myself, my family, my friends, and to cherish those readers who get me. Thank you.